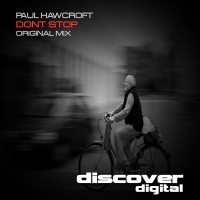 Paul Hawcrofts latest offering is the stunning "Don't Stop"
Based around a sampled female vox immediately identifies the track which moves to the breakdown with a techno vibe that gives no clues as to the melodic delights that are to follow. When it hits the breakdown everything becomes clear. This is an anthem in waiting. 'Dont Stop' is available now from Beatport and iTunes.